Parmesan.com, a resource guide and community website for sharing recipes about Parmigiano Reggiano® cheese, announced the launch of the Let’s Get Cooking Sweepstakes in which the winner will receive a $250 gift certificate to Oneida.com. To enter the sweepstakes, participants must visit the Parmesan Facebook page, fill out the entry form, and sign up for membership at Parmesan.com. Parmesan.com is the English language consumer website for Parmigiano Reggiano cheese, made exclusively in Italy. The website provides a myriad of resources, games, tips, and Parmesan cheese recipes to help users understand the secrets to savory Italian cuisine. Once registered at Parmesan.com, members are able to share their own recipes, write reviews, and save their favorites. 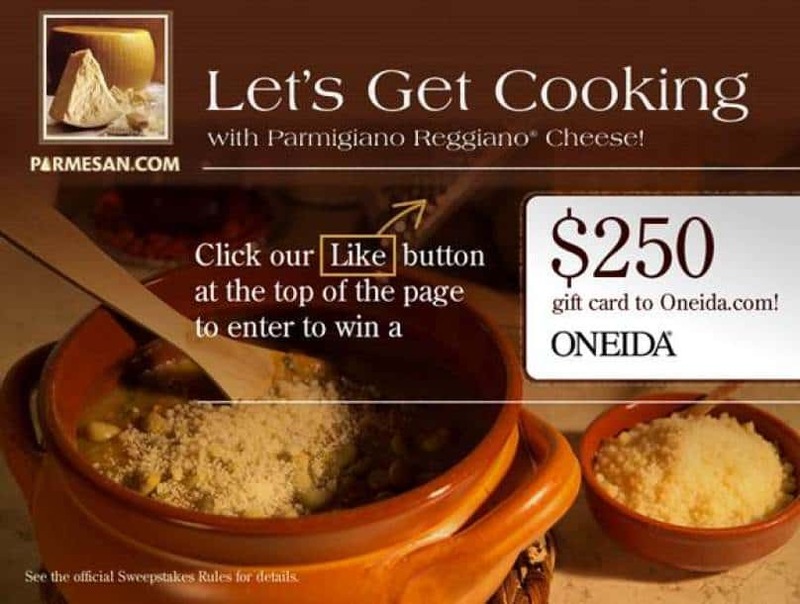 To inspire people to make Parmigiano Reggiano cheese a regular part of their cooking routines, Parmesan.com has partnered with Oneida Ltd. to give away a $250 gift certificate to Oneida.com. Driven by devotion to design, Oneida prides itself on the finest quality products and modern, decorative and classic tableware collections. The sweepstakes will run from August 8, 2012 through August 26, 2012, after which one winner will be randomly selected to receive the prize. For a complete list of rules, please visit the terms and conditions page. Parmesan.com is the newest and most complete source for recipes, cooking inspiration and information about Parmigiano Reggiano® cheese on the web. Parmesan.com provides a number of chef-created and user-submitted recipes — from your favorite Italian classics to lesser known recipes that will surprise and delight you, like Parmesan ice cream. Visit Parmesan.com and connect on Facebook, Twitter, and YouTube for interactive learning opportunities and inspiration for delicious recipes. Oneida Ltd. is one of the world’s largest designer and seller of stainless steel and silverplated flatware for the consumer and foodservice industries. It is also the largest supplier of dinnerware to the foodservice industry in North America. The company operates in the United States, Canada, Mexico and Latin America, Europe and Asia marketing and distributing tabletop products, which include flatware, dinnerware, crystal stemware, glassware and kitchen tools and gadgets. The company originated in the mid-nineteenth century and has since grown into one of the most recognized brands in the industry. Driven by devotion to design, Oneida prides itself on the finest quality products and modern, decorative and classic tableware collections.